emailed to me by freedback.com. You should receive a reply from me within a day. 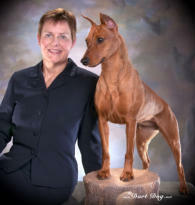 What drew you to select a German Pinscher for your next companion? Do you have the finances required to feed, vet and train any dog you purchase? List the names and ages of any children who reside in the home or are routine visitors. List any other pets in the home that the German Pinscher would be expected to get along with. How many hours a day will the dog be left home alone and where will you keep the dog while you are away from home and the dog is alone and unattended? Have you ever given up a dog? If yes, please describe the circumstances. Please provide the name and phone number of the vet/practice if you have a current vet and one personal reference. Do you have any questions of me that have not been sufficiently answered on my website? and your answers wll be emailed to me by freedback.com.